A video of John Arne Riise blasting a free-kick into the top corner against Manchester United proved to be a welcomed reminder of just how valuable having a deadly left-foot in the team can be. Liverpool have been blessed with left pegs throughout history, whether it be Riise’s sheer power, the wands of John Barnes and Robbie Fowler or even the illusive Luis Garcia. The list goes on. Daniel Agger, Patrik Berger, Harry Kewell, Emiliano Insúa- kidding, although he did score a belter against Arsenal. As solid as James Milner has been at left-back and as magical as Philippe Coutinho has been cutting in from the left, it’s difficult not to miss convention sometimes. A true ‘lefty’ whipping in crosses, stepping up to deliver the set-pieces that aren’t suited to a right-footed player, bursting up and down the flank, staying glued to the touchline. That said, Jurgen Klopp does have several natural left-footers at his disposal, many of whom, though, find themselves facing uncertain futures at Anfield. An undeniably gifted elite member of Liverpool’s squad and a man whose talent makes it seem ludicrous to think the club could sell him this summer. A striker with a left-foot capable of punishing any defence in the Premier League and yet someone who hasn’t been able to do so on a regular basis. Injuries have cruelly hampered the career of a truly special player and stopped him from scoring anywhere near the amount of goals that he should have by now. In two league performances and a post-season friendly, he, frankly unsurprisingly, has sparked a u-turn with regards to fans fearing what a mistake the club could be making by letting him leave. Liverpool won’t sign a better striker this summer than a fully fit Daniel Sturridge, making his setbacks all the more frustrating. His left foot promises flair, an unpredictability and a clinical finish- all of which make him somewhat unique. 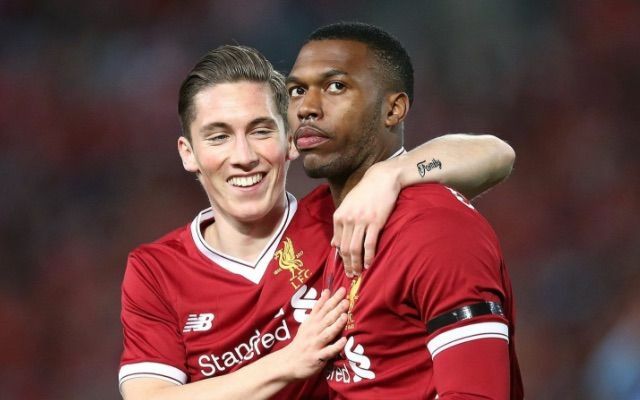 Only Sturridge himself knows what his future holds. Will he stay? We hope so. Liverpool turning down an offer for Harry Wilson from Scottish champions Celtic poses as a significant confidence boost for the youngster having been unlucky not to have earned the same first team opportunities as his fellow youth stars last season. The U23s captain scored 28 goals in all competitions across the 2016/2017 campaign with fans unable to work out why he hadn’t been featuring alongside the likes of Trent Alexander-Arnold, Ben Woodburn and Ovie Ejaria in cup games for the senior side. He seemingly remains to be a part of Klopp’s plans, though, and, in being a naturally left-footed winger, has the potential to enjoy a breakthrough season given the team’s need for greater width. His performances for the club’s second string-side have showcased just how useful he can be in crossing positions and what a force he can be in front of goal. There is time for him yet. It remains to be seen what the summer holds for Sheyi Ojo, who rarely featured for the first team last season due to injury problems. Like Wilson, he still has a chance to prove himself as a useful squad player thanks to the width he provides. He also has the added bonus of the pace and directness that has seen Sadio Mane fit perfectly to Klopp’s system and style of play. Ojo won’t be overlooked, but has to use this summer to remind his manager of what he can offer. It’s worth remembering he is still only 19-years-old and already working with high expectations looming over him. Criticism from his manager earlier on in the season for not doing enough in a rare start went someway towards recognising that Klopp does regard him highly. The base of the teenager’s game isn’t power but instead finesse and a teasing and sharp left-foot. He represents the kind of raw footballing commodity Klopp will feel he can mould into a key contributor. The thinking behind Ragnar Klavan’s inclusion comes from remembering just how high Daniel Agger set the bar as a left-footed, left-sided central defender before his departure in 2014. Klavan didn’t arrive from Augsburg with the same grace as Liverpool’s former Dane but did add a grit and physicality that has since seen him earn plenty of respect during his time at the club. It hasn’t always been pretty but he has done all Klopp could perhaps ask for from a £4.2million 31-year-old. A sensible head, experience and hard work. Liverpool’s decision to prioritise the signing of a new centre-back this summer makes it possible Klavan could leave. If this does turn out to be the case, he deserves credit for stepping in relatively comfortably and presenting himself as a fairly reliable backup throughout a physically and mentally gruelling season that could well have forced him into making mistakes. The likelihood is that the Spaniard will leave the club this summer after failing to cement a place as Liverpool’s first choice left-back. It’s been a disappointing year for the former Sevilla man, yet it’s still worth remembering he is a talented footballer with the pace and forward movement capable of making him a great attacking threat. An ideal world would have seen a player like Moreno develop into a reliable and influential figure at left-back. At his best in a Liverpool shirt, he has flown up and down that left-hand side but, with his defensive frailties, also allowed Klopp and supporters to realise that he wasn’t going to progress. Liverpool will get their new ‘lefty’ during this transfer window. Mohamed Salah? Ryan Sessegnon? Andrew Robertson? The club will get one.